It is entirely possible that the VIX and general market volatility remain subdued for the rest of the year. With so many managers underperforming the indexes, and lots of gold and bond money floating around, there could be a constant bid for stocks heading into year end. This is before any POMO consideration, which I think is over-rated in effectiveness, but has powerful psychological market implications. I’m not predicting market direction, just surmising that there could be a line of folks looking for an entry, so pullbacks could be small. Thus, the VIX will not respect a falling market until it demonstrates an ability to violate widely watched levels, like the infamous 50 day moving average. What to do for vol traders? Quite simply, there are always vol opportunities when you consider earnings and event driven trades. Short-term options reflect the potential for big moves, while the longer-term options reflect less volatility. Interestingly, for true vol fans, this concept is discussed by Jamie Mai in Hedge Fund Wizards, one of Jack Schwager’s great interview-style books. Jamie discusses why it is counter-intuitive that longer vol should be lower than short-term vol when the potential for major unknown event risk sits between the short options and the long options. Check it out for some fascinating reading. A terrific platform for Online Pokies vol trading is LiveVol, and I have had the privilege of giving it a test drive over the last couple weeks. Vol traders will absolutely love this, it is built specifically for them. And earnings season is perfect for a platform build for setting up vol specific trades. The weekly implied volatility (circled) is 80 points higher than the January calls. This is an excellent opportunity to sell one against the other. When earnings are revealed, the short term IV will implode, while the long-term will fall at a much lower rate. 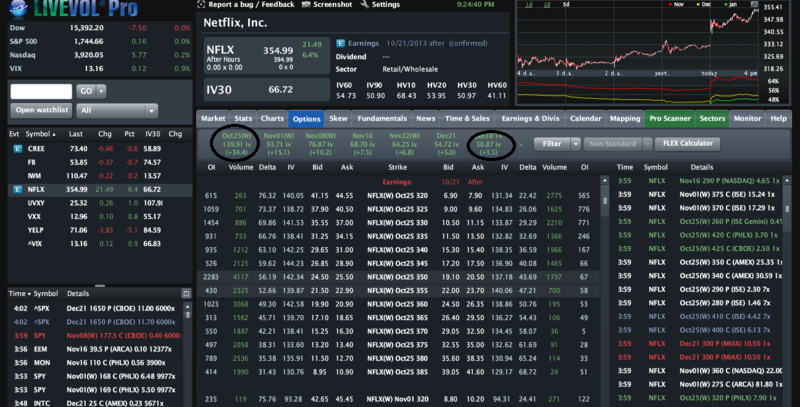 This was set around 10% out of the money when I put it on, and NFLX rose by 5% during the day and 9% after hours. I specifically set the short call 10% out of the money, as I felt I was getting a good value provided by short-term earnings traders. This trade had only about 50% of overnight downside, but has unlimited return potential. AMZN, FB, and countless other weekly options provide this opportunity. 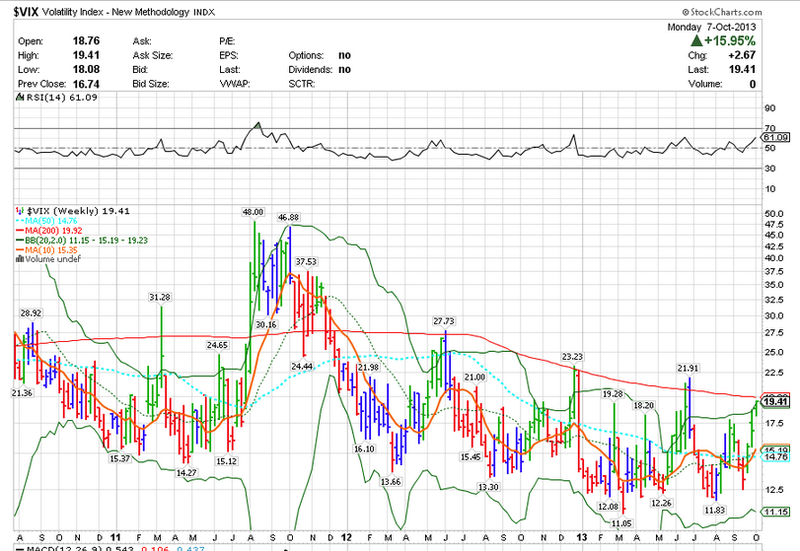 So while the VIX is low, selling vol is still easy to do on an asymmetric risk/reward basis. Realistically, we are not that high, in fact we are about average for an October VIX. Looking at past mini-crises in recent years, the VIX has been much higher. The last debt ceiling debacle saw a VIX of nearly 50. As recently as last December it was 23. So 19 is not that high, and this chart demonstrates that. We have not had a real correction for over two years, so there are a lot of folks out there that have had nothing to fear for a long time. Add to that the consensus opinion that the government will come to a deal on Oct. 17th, and you have a recipe for a surprise. I’m not expecting a cataclysmic event either, but you must keep in mind what could go wrong. This structure means that the VXX and UVXY are adding value as they roll into November, by purchasing cheaper futures (NOV) and selling more expensive ones (OCT). This is positive roll and for the VXX and UVXY it is rare. But this situation can certainly imply more equity market pain. I’m getting itchy to sell vol, but it is not the time, because we are nowhere near a resolution, and a lot of index charts are implying more downside. The S&P broke the 50 SMA today, and the Russell 2k just gave a MACD cross lower sell signal. I’m literally sitting on my hands right here, but should there be a break in the logjam (doubtful this week, IMO), then I will be ready to act. The VIX finally came alive, as the market really cascaded through obvious support levels on heavy volume. This is still not the time to sell vol unless you are very nimble. There will be plenty of time to sell it after the event risk ends and the volatility exhale commences. I warned readers to be wary of selling vol recently, and those that ignored that are feeling some pain. Patience is key in finding the entry point. If you have to be early, save some selling power for a real scare. We may have two weeks to go before the optimal entry point presents itself. Stay tuned. These are the opportunities you wait months for.